Join the discussion on our forums! 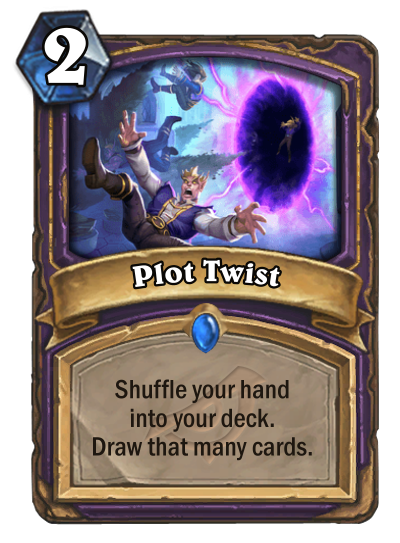 Come discuss Plot Twist over in our dedicated Plot Twist discussion topic. Been playing Arena as a FTP player and slowly making my scene into the Ranked playlist with some interesting decks to keep me entertained. I am thinking of having a deck d*** near solely built around 2 Plot Twist in the dirty thirty to climb to the top like the sweating animal I always knew and can be. I've had fun using it with Untamed Beastmaster. Glad to see tolarian winds make its way into hearthstone. This card is nuts. If it doesn't see play now some wild combo deck will differently want to play it in the future. If you need some healing, you can try to find Aranasi Broodmother with this. Then shuffle Broodmother and again draw her. A way to activate value of Portal Keeper and Portal Overfiend. I smell shenanigans... Are those any good though? Are you guys ready for some truly stupid combos with Dollmaster Dorian.